At the heart of North America’s gateway to Asia Pacific, Richmond boasts direct multi-modal access to British Columbia’s largest trading partners: the U.S. and China, as well as other rapidly emerging global markets. Located on Canada’s picturesque West Coast, Richmond is the 4th largest of the 22 cities that make up Metro Vancouver (population 2.5 million). A short 20 minutes to the north is Vancouver’s downtown core, and 30 minutes to the south is the U.S. border leading into Washington State. Richmond is home to Canada’s 2nd busiest airport which served over 24 million passengers and over 314,000 tonnes of cargo in 2017. Named the Best Airport in North America by international passengers at the Skytrax World Airport Awards, YVR is also dedicated to serving business clients with its 1,000,000 square foot cargo village and extensive air-to-truck logistics network. YVR already has greater reach into Asia than all other airports on the West Coast and continues to build on its strategic vision of being North America’s gateway between Asia and the Americas. Currently undertaking a $9.1 billion expansion plan. The Port of Vancouver is Canada’s largest port, North America’s third largest port, and moves cargo across five business sectors for the international and domestic shipping community. Richmond is a major logistics and transloading centre for the port, offering warehouses, transportation operators and supply chain professionals, as well as a dedicated 700-acre, rail- and highway-serviced port transloading facility. Serviced by three Class 1 railroads and one regional short line railroad; on-dock rail facilities at container and cargo terminals. Ongoing improvements to road networks ensuring a safe, reliable and efficient multi-modal transportation network. A short 30 minute drive from Richmond is the U.S. border and direct link to the I-5, the main Interstate Highway linking Washington, Oregon and California. Highway 99 and 91 intersect in Richmond, providing efficient east-west and north-south connections for employees, businesses and goods movement. The region is served by three Class 1 railways which connect North America’s West Coast, East Coast, and South Coast. Intermodal service is provided across Canada, as well as to Chicago and other major North American logistics hubs via excellent connections to major U.S. railways. Several industrial properties in Richmond are serviced by rail, including a dedicated 700-acre port oriented logistics centre managed by the Port of Vancouver. Click the map below to explore the region’s complete rail network. As the premier multi-modal distribution hub of Canada’s West Coast, Richmond can deliver on every aspect of your supply chain whether your business exports products and services globally or brings in goods for distribution throughout North America. Freight forwarders skillfully ensure goods move from point of origin to point of destination to arrive at the right place, at the right time, in good order and condition, at the most economic cost. Trade officers are located in 12 cities across Canada and in more than 140 cities worldwide. Officers can help you assess your export potential, identify key foreign contacts, find new markets abroad, implement your export strategy and obtain relevant advice and intelligence. Canada Customs and U.S. Customs can assist with customs documentation. You can also contact a local customs office or a customs broker. Home to more than 200,000 people, Richmond is the fourth largest city in the province and the second most diverse city in all of Canada. In total Richmond boasts a citizenry from over 140 different ethnic origins, which is a significant asset for companies conducting business across the globe. 37% of Richmond’s working aged population is university educated – this is higher than the provincial and national average. Local businesses generate over 100,000 jobs for these workers, positioning Richmond as a major employment centre in British Columbia and Metro Vancouver. There are 1.4 jobs for every resident worker in the city, drawing skilled workers from Vancouver, Burnaby, and other neighbouring cities. Metro Vancouver is home to 10 higher education institutions including renowned Simon Fraser University and the University of British Columbia. The British Columbia Institute of Technology, Kwantlen Polytechnic University and Trinity Western University have campuses in Richmond specializing in aviation, technical apparel design, agriculture, and a variety of academic programs. 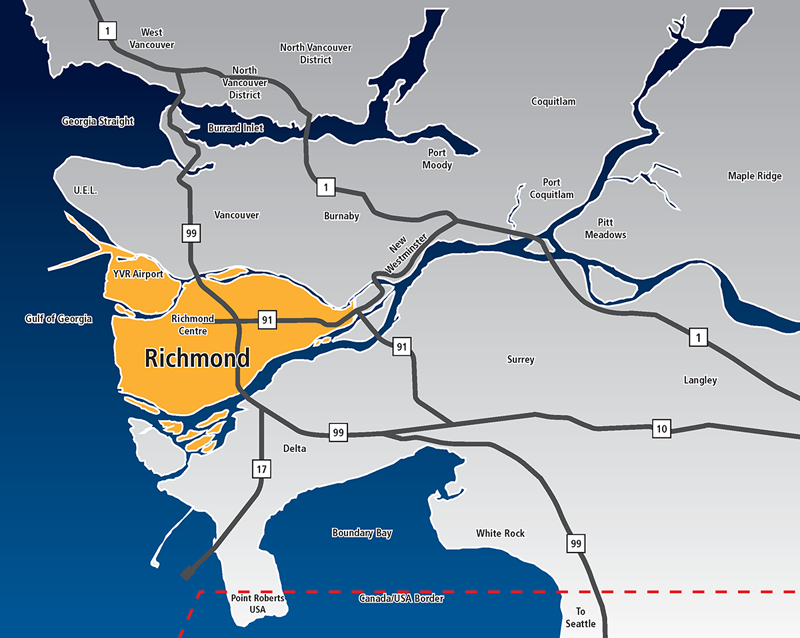 Choose Richmond as the home for your global business because of our low corporate income tax, labour, facility and transportation costs – and because of our strategic location on Canada’s west coast. British Columbia’s tax competitiveness ranks among the best in North America with a corporate income tax rate of only 12 per cent. When combined with the federal rate, British Columbia businesses pay a combined general corporate income tax rate of 27 per cent – among the lowest in the G7 and extremely competitive against other Canadian and major U.S. cities. The Government of British Columbia offers tax credit programs to encourage growth in specific industry sectors including international financial services, mining exploration, film and TV production, new media and other international business activities. Search all grants, incentives & credits at Funding Portal. All levels of government are committed to encouraging trade between British Columbia businesses and the rest of the world. Global Affairs Canada offers assistance with exporting and importing, information on key markets, data on trading partners and on-the-ground intelligence and assistance establishing in new markets. Trade and Invest British Columbia provides support for inbound and outbound trade development including trade missions, market intelligence, investment introductions and global business accelerators in target markets such as India, China and the United States. Contact us for a referral to the trade officer or program best suited to your business objectives. Whether your business is looking for retail, commercial, industrial or agricultural land – Richmond has it. We have over 36 million square feet of airport- and port-connected industrial space and 4.5 million square feet of office space in the City along rapid transit networks and in established and anchored technology parks throughout Richmond. Use the City’s Interactive Map to identify zoning and other property information for potential sites. Search or browse SpaceList for up-to-date listings of over 300 commercial and industrial properties for sale or lease in Richmond. Contact us to get started on your site selection process. Use this tool to view a detailed cost breakdown for Richmond including payroll costs, taxation, energy and utility rates – and see how we compare to other British Columbia municipalities. Richmond is a thriving city where culture and character converge in a stunning setting. Where the refined and the raw mix, and contrasts are celebrated. It’s a place that’s constantly redefining itself. Dynamic and alive, it encourages visitors to leave their comfort zone and rewards them with unique and authentic experiences. The soul of the Pacific. The true coast of Canada. Learn more about what makes Richmond an amazing place to visit, live and do business. Richmond is a waterfront city of striking mountain views, west coast sunsets and lively urban living. As the 4th largest city in the province of British Columbia, Richmond contributes over 200,000 to Metro Vancouver’s total population of 2.4 million. The city comprises most of the islands in the Fraser River delta including Sea Island, home of the Vancouver International Airport. The city has a unique mix of new and old, from urban high-rises in the downtown core to vast agricultural tracts of land, a historic fishing village turned popular tourist destination and several diverse community neighbourhoods. 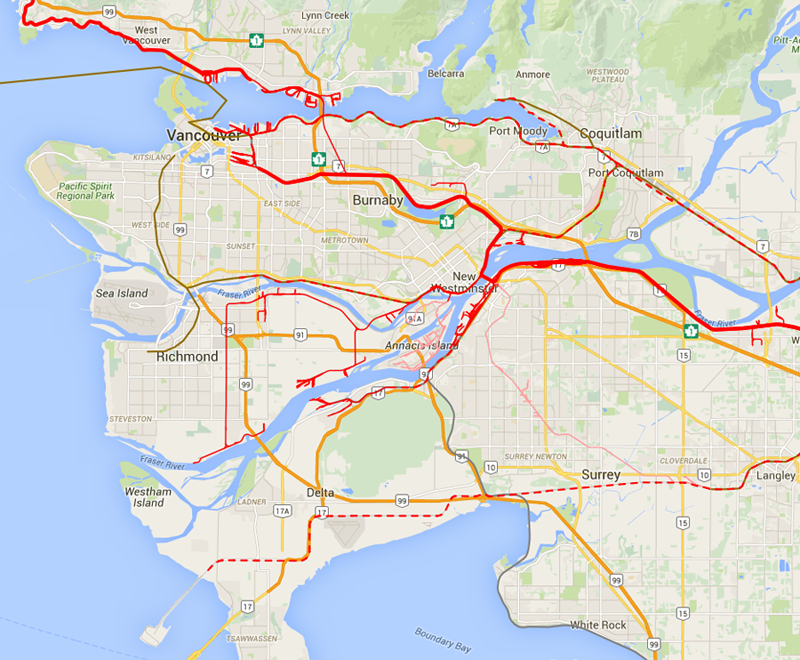 Richmond is just 20 minutes from Downtown Vancouver and 30 minutes from the U.S. border. Ferry, road and air connections link travellers daily to Vancouver Island, the rest of Canada, and many global destinations. Richmond enjoys a temperate west coast climate. Unlike other parts of Canada, the west coast gets little or no snow most winters, and because of Richmond’s distance from the mountains, its average rainfall is 25% less than Vancouver’s, at 1228 mm. While Richmond does not experience extreme temperatures, all four seasons bring a change in weather. The city’s annual average temperature is 11C (51F), which can fluctuate in the summer months up to 30C (85F). In the winter, the temperature rarely drops below freezing (32F). Visit Environment Canada’s Weather Office for more on local weather, forecast and trends. A variety of emergency and community safety services are available to Richmond residents. Dialling 9-1-1 connects residents to police, fire and ambulance services. Two Richmond Community Police Stations handle non-emergency calls and address community concerns. The stations are operated by citizen volunteers and RCMP members. They offer a variety of services and information on subjects such as home security, auto crime, identity theft and road safety. Visit the City of Richmond’s website for more on Emergency Preparedness Programs, Block Watch, Environmental Health and Citizens’ Crime Watch. Richmond offers a variety of housing options that include single-family homes, town homes, condominiums, coach houses, apartments and suites. One can choose to live in a suburban neighbourhood, or in the City Centre, which has experienced a rapid development of high-rise condominiums and apartments near transit, amenities and services. Richmond has over 77,000 dwellings, with 74% of residents owning their own home . See our Data Centre for real estate prices and trends in Richmond. MLS.ca is the leading source when searching for residential properties for sale. Rental properties can be browsed via online listings services such as Craigslist or Kijiji, or by contacting a local property management company. View our Housing Characteristics Hot Facts for more information on housing stock and occupancy rates. Landlords and tenants can visit the British Columbia Residential Tenancy Office for information and local rental laws. Visit the Housing section of the City of Richmond website for more on subsidized and supportive housing options. In Richmond, public education from Kindergarten to Grade 12 is administered by the Richmond School District No. 38. 48 schools and over 3,000 employees ensure the 22,000 local students are well supported. Settlement workers speak multiple languages and are available to help newcomer students and their families adapt to the local public school system. Available alternatives to the public school system are private schooling and home schooling, with information located at the Ministry of BC Education and the Federation of Independent Schools Association. The Medical Services Plan is available to British Columbia residents who are Canadian citizens, landed immigrants or government-assisted refugees. This service pays for many health care costs such as doctors and most medical tests and treatments. The College of Physicians and Surgeons of British Columbia is the licensing and regulatory body for all physicians and surgeons in the province. To locate a family physician accepting new patients, go to www.cpsbc.ca. Free access to non-emergency health information is available by phone by dialing 8-1-1 or via www.healthlinkbc.ca. With 200 beds, Richmond Hospital provides services including Emergency, Ambulatory Care, Diagnostics, Intensive Care and Coronary Care, Maternity, Psychiatry and Surgery. For emergencies, dial 9-1-1. Richmond is known throughout the Vancouver region for its quality parks and recreation, cultural & heritage facilities. Richmond has over 145 parks that total approximately 1950 acres and an additional 200 acres in a recreational trail system. The city offers a wide variety of public and private recreational amenities, including pools, arenas, community centres, tennis courts, playgrounds, picnic areas, golf courses, lacrosse boxes, running tracks and playing fields. Unique and exciting dining, shopping, attraction and activity options are also available to residents and visitors. Richmond is connected to neighbouring cities within the Lower Mainland by a series of bridges and a tunnel. There are two major freeways feeding into Richmond – highways 99 moving North-South and 91 moving East-West. The Vancouver International Airport (YVR) connects Richmond to the world. Public Transit services are provided by TransLink, in partnership with the City. The Canada Line is a rapid transit skytrain service linking Richmond to YVR and downtown Vancouver.